This baton was referenced in the "Ceremony of Laying the Corner-Stone of the Egyptian Obelisk", which is found printed in the "Transactions of the Grand Lodge of New York, 1881" as follows: "In concluding this report, I desire to place on record the liberality of Mr. William Henry Hurlbert, editor of the New York World, who presented your Marshal of the Day with the elaborate and beautiful baton he carried upon that occasion." During Grand Master Jesse B. Anthony's address, he said, "That [obelisk, for] which we have today laid the foundation stone, was one of two originally located at Heliopolis some 3,400 years ago, and afterwards, [1,903 years ago], removed to Alexandria, where they received the name of Cleopatra's Needles. One of these now adorns the city of London, and the other will add to the attractiveness of this place and recall to our minds by its allusions the important lessons of past centuries...There is nothing done in masonry that is not for a purpose and is not designed to impress its lessons upon us. What is the design upon the trestle board today? What has been brought prominently before you on this occasion?...Is it not that a man's work in this world lives long after he has laid down the implements of labor, and that his influence does not entirely cease with the termination of life's powers? This obelisk erected thousands of years ago is not without its lesson to us of today. The ancient workman did not build for an age, but for eternity. So with us, brethren; we may not consider that our efforts amount to much of themselves, but nevertheless every one has his influence, and in a greater or lesser degree we contribute to the aggregate whole. The obelisk measures about sixty-nine feet, and is about eight feet across at the base. It weighs between 193 to 220 tons, and the removal, transport and erection of such a large monument was an amazing feat of engineering. When the obelisk was removed from the base, there was a curious arrangement of stones found in the base that seemed to represent Masonic symbols. This arrangement was meticulously recorded by Brother Gorringe so that it could be re-duplicated when the pedestal was set in New York. "From the Grand Lodge of Masons in Egypt, among whom there was a number of Egyptologists and Archaeologists sent a committee of its best men...were unanimous in the opinion that the emblems were Masonic. The stones were described as follows: 1) A polished cube, of syenite, believed to be the Perfect Ashlar; 2) A polished square, of syenite, believed to represent the Square; 3) A rough and irregular block of syenite, believed to be the rough ashlar; 4) A hard lime stone with a trowel cemented to its surface, emblematic of Freemasonry; 5) A soft lime stone, very white and entirely free from spots, believed to symbolize purity; 6) An axis stone, with figures resembling snakes, believed to represent the trestle-board, the snakes to represent Wisdom; 7) A marked stone, believed to bear the mark of a Mark Master; 8) A corner stone, found under the east angle of the lower steps." (Baird, 1915) A lead plumb was also found near the base. The exacting reports from these observers can be found in 'The Obelisk and Freemasonry', written by Dr. John A. Weisse in 1880. The obelisk measures about sixty-nine feet, and is about eight feet across at the base. It weighs between 193 to 220 tons, and the removal, transport and erection of such a large monument was an amazing feat of engineering. When the obelisk was removed from the base, there was a curious arrangement of stones found in the base that seemed to represent Masonic symbols. This arrangement was meticulously recorded by Brother Gorringe so that it could be re-duplicated when the pedestal was set in New York. "From the Grand Lodge of Masons in Egypt, among whom there was a number of Egyptologists and Archaeologists sent a committee of its best men...were unanimous in the opinion that the emblems were Masonic.<br>The stones were described as follows: 1) A polished cube, of syenite, believed to be the Perfect Ashlar; 2) A polished square, of syenite, believed to represent the Square; 3) A rough and irregular block of syenite, believed to be the rough ashlar; 4) A hard lime stone with a trowel cemented to its surface, emblematic of Freemasonry; 5) A soft lime stone, very white and entirely free from spots, believed to symbolize purity; 6) An axis stone, with figures resembling snakes, believed to represent the trestle-board, the snakes to represent Wisdom; 7) A marked stone, believed to bear the mark of a Mark Master; 8) A corner stone, found under the east angle of the lower steps." (Baird, 1915) A lead plumb was also found near the base. The exacting reports from these observers can be found in 'The Obelisk and Freemasonry', written by Dr. John A. Weisse in 1880. The obelisk was removed from its pedestal on December 6, 1879. After loading the pedestal, which weighed almost 50 tons, onto the Dessaug, the obelisk was loaded through a hole made in the side of the ship while the ship was in dry-dock. The ship was launched on March 31, 1880, but was not able to cast off until June 12th, 241 days from the start of the operation. On July 20th, 1880, the ship landed off Staten Island, New York. While the corner-stone laying ceremony happened shortly thereafter, on October 9, 1880, final placement of the obelisk did not happen until a little over a year from the date of its removal from its pedestal in Alexandria. The obelisk was set onto its pedestal in Central Park on January 22, 1881, after a long, slow journey through the streets of New York. (D'Alton, 1993) In 1956, "Cecil B. deMille [a member of Prince of Orange Lodge No.16, New York, NY]...donated four additional plaques giving translations of the hieroglyphs." (D'Alton, 1993) The obelisk on Graywacke Knoll in Central Park, close to the Metropolitan Museum of Art, remains a vital testament to the ingenuity of stone-masons and engineers. RW Edward C. Ehlers served as Master of Continental Lodge No. 287 from 1902 to 1903. A gold-tone metal baton with an ivory hand-grip (measuring 15.2 cm) in the center. The ivory grip has a rounded center with pinched-in ends and is engraved in the center portion with five deep lines on either side of a central, raised section of ivory. On either side of the ivory center is a smooth tube of gold-tone metal. Set close to both ends of each tube is a raised band with oval design elements. Against the smaller side of the ovals is a band of small circles. On the left side of the ivory center, this row of circles is on the left of both bands, while on the right side of the ivory center, this row of circles is on the left side of the band closest to the center and is on the right side of the band closest to the base. These bands likely are placed to hide the joining of the various elements of the baton. To the left of the central ivory piece, and inside of the two bands, there is engraved on the gold-tone metal tube; "Presented to R.. W.. Edward M. L. Ehlers by William Henry Hurlbert." "Presented to" and "By" are in a slanted, all capital-letter block font, while the names are in an elaborate, large and small letter calligraphic font. On either side of the word "By" are design elements similar to arrow fletching. The gold-metal tube to the right of the central ivory piece is blank. On either end of the baton, outside of the bands decorated with oval design elements, is a circular row of seventeen amethyst stones, set into a band on a higher plane than the gold-tone metal tubes. From this band of amethysts is a rising, curved-outward section of metal, decorated with a band of eight leaves that ends in a notched band. Next is a raised, rounded, smooth band, which ends with a flat disc, the rim of which is notched. This disc is engraved with a raised, scalloped-edge design. On the left side of the baton, attached to the disc, there are four concave, stylized curves that stand on a smooth, small curled-outward foot and that end in an engraved, thick, curled-inward top. The outsides and what is visible of the inside of these stylized curves are engraved with a pattern of feathers overlaying each other in a vertical row. The tops of these curls support a three-stepped, four-cornered square base, upon which is a model of the obelisk known as Cleopatra's Needle, the New York Obelisk, or one of the Alexandria Obelisks. Each of the four sides of the obelisk model is carved with a close approximation of some of the hieroglyphs is found on the actual obelisk. Resting on the disc on the right side of the baton are four s-curves, also decorated with an engraved feather design. These s-curves start with a large, curled-inward engraved base and end with a small, smooth, outward curling top. Resting on these tops is a small, ridged disc, on which is a pinched-in section which expands into the shape of an outward-pointing acorn, the bottom of the baton, if the obelisk on the other end is held vertically. The metal is coated with a clear substance, parts of which have degraded. These degraded spots of coating are visible in the matte images. 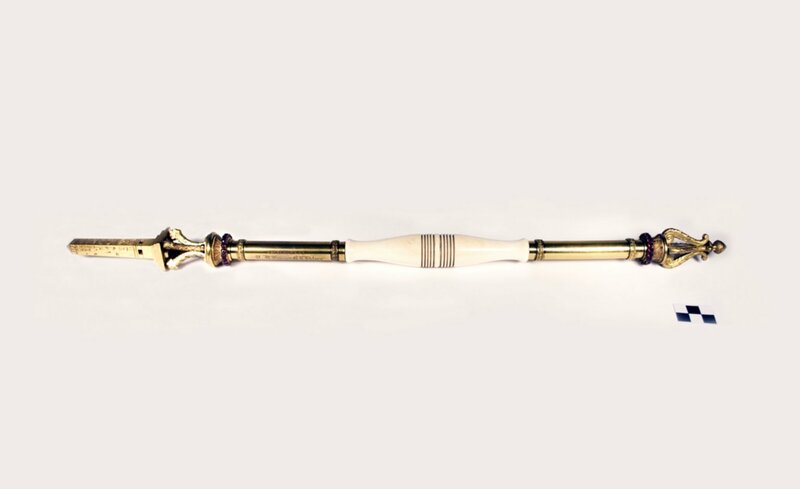 A gold-tone metal baton with an ivory hand-grip (measuring 15.2 cm) in the center. The ivory grip has a rounded center with pinched-in ends and is engraved in the center portion with five deep lines on either side of a central, raised section of ivory. On either side of the ivory center is a smooth tube of gold-tone metal. Set close to both ends of each tube is a raised band with oval design elements. Against the smaller side of the ovals is a band of small circles. On the left side of the ivory center, this row of circles is on the left of both bands, while on the right side of the ivory center, this row of circles is on the left side of the band closest to the center and is on the right side of the band closest to the base. These bands likely are placed to hide the joining of the various elements of the baton.<br>To the left of the central ivory piece, and inside of the two bands, there is engraved on the gold-tone metal tube; "Presented to R.. W.. Edward M. L. Ehlers by William Henry Hurlbert." "Presented to" and "By" are in a slanted, all capital-letter block font, while the names are in an elaborate, large and small letter calligraphic font. On either side of the word "By" are design elements similar to arrow fletching. The gold-metal tube to the right of the central ivory piece is blank.<br>On either end of the baton, outside of the bands decorated with oval design elements, is a circular row of seventeen amethyst stones, set into a band on a higher plane than the gold-tone metal tubes. From this band of amethysts is a rising, curved-outward section of metal, decorated with a band of eight leaves that ends in a notched band. Next is a raised, rounded, smooth band, which ends with a flat disc, the rim of which is notched. This disc is engraved with a raised, scalloped-edge design.<br>On the left side of the baton, attached to the disc, there are four concave, stylized curves that stand on a smooth, small curled-outward foot and that end in an engraved, thick, curled-inward top. The outsides and what is visible of the inside of these stylized curves are engraved with a pattern of feathers overlaying each other in a vertical row. The tops of these curls support a three-stepped, four-cornered square base, upon which is a model of the obelisk known as Cleopatra's Needle, the New York Obelisk, or one of the Alexandria Obelisks. Each of the four sides of the obelisk model is carved with a close approximation of some of the hieroglyphs is found on the actual obelisk.<br>Resting on the disc on the right side of the baton are four s-curves, also decorated with an engraved feather design. These s-curves start with a large, curled-inward engraved base and end with a small, smooth, outward curling top. Resting on these tops is a small, ridged disc, on which is a pinched-in section which expands into the shape of an outward-pointing acorn, the bottom of the baton, if the obelisk on the other end is held vertically.<br>The metal is coated with a clear substance, parts of which have degraded. These degraded spots of coating are visible in the matte images. Obk. 1 through Obk. 15: Photographs taken in-house. Obk. a through Obk. p; published in D'Alton, 1993.